From social network analysis to speciation in the Neotropics: exciting research by early career ornithologists. 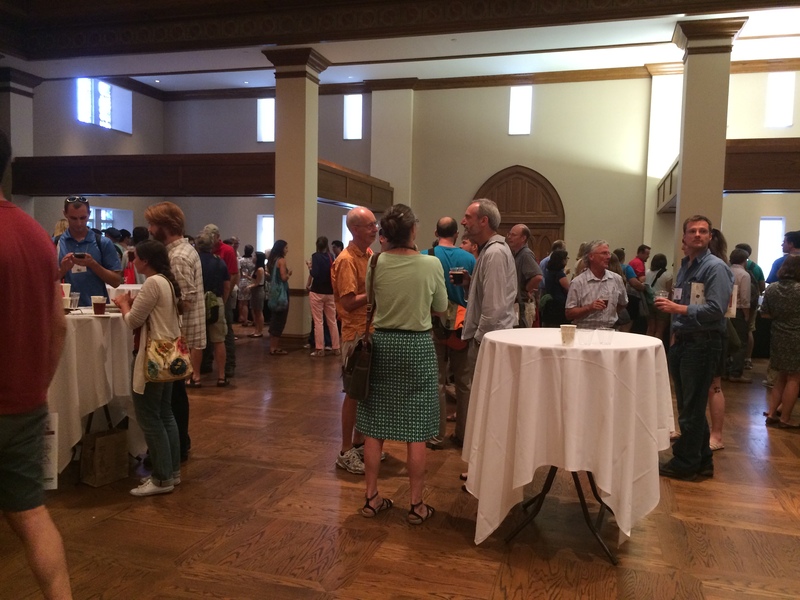 Mentoring in action: the networking event that occurred after the lightning talks by early career ornithologists that I described in my earlier post. As I mentioned in my earlier post, the joint American Ornithologists Union (AOU) and Cooper Ornithological Society (COS) conference this year emphasized a renewed focus on early career professionals. Such a practice is key in supporting early careers folks in a time when the job market is tight and funding rates are very low. Many of us may receive quality one-on-one mentoring at our home institutions, but this type of feedback in a conference setting from individuals that may be on search committees or grant review panels is also invaluable. AOU is not the only organization to recognize this need. The Society for the Study of Evolution (SSE) also provides opportunities for one-on-one mentoring for early career professionals, and I’m sure readers can name other scientific organizations and conferences that do the same. In all, this is an important movement among organizations to foster the next generation in tangible ways. Keeping in the spirit of this movement, I’d like to highlight papers given by early career individuals from the AOU-COS 2015 conference. Jared Wolfe, trained in Phil Stouffer’s lab at Louisiana State University and now with the USDA forest service, gave one of the Cooper Young Professional presentations. Using one of the more elegant sets of slides I’ve seen, he presented research by himself and colleagues in the Stouffer lab on the impact of second growth forest on the behavior, survival and biogeography of birds in the Amazon. This research was based in the Biological Dynamics of Forest Fragments Project (BDFFP), started in 1979 by Thomas Lovejoy near Manaus, Brazil. The BDFFP consists of a series of differently sized old growth fragments that are being reconnected by second growth forest of different ages. Comparing this incredible study site to a series of islands created by flooding in a nearby area around the same time, Wolfe and colleagues were able to demonstrate that, at least for birds, forest fragments do not behave like islands in terms of species composition or survival. They also asked whether second growth is ‘bad’ or ‘good’ habitat. By comparing fragments embedded within variably aged second growth (from <5 years to >10 years), they demonstrated that edge birds do well with young second growth whereas insectivorous understory birds do not. As the second growth matures, they found that young insectivorous understory birds begin to recolonize regenerating forest and it was hypothesized during Q&A that the most sensitive bird species may recover after 60 years of regeneration. Perhaps the most interesting finding to me was that networks of mixed- species flocks were quite unstable in second growth itself, but began to exhibit a more complete network in fragments connected by second growth. It is worth noting that these results are the work of thousands of hours of netting, surveying and following birds with radio telemetry in difficult field conditions year round. Of great interest to Neotropical ornithologists who do not have a trusty Pyle guide to turn to, Wolfe and Erik Johnson have worked out aging techniques based on molt cycles and plumage patterns for a number of tropical species, which will open up new avenues of research on these birds. Very exciting! Expect that work out soon through the Studies of Avian Biology. Finally, I should note that Wolfe and two colleagues, Luke Powell and Jacob Cooper are working to address the same questions in Equatorial Guinea, Central Africa, as well as conserve rapidly disappearing species in that region. Be sure to check out their endeavors (https://www.facebook.com/egbirds) and future publications! Maya Faccio, a Ph.D. student in the Weir Lab at the University of Toronto, gave a great talk on the genomics of speciation in the Hypocnemoides Amazonian complex. The ranges of many Amazonian birds are defined by river barriers and generally are thought to drive speciation in allopatry. Faccio and colleagues examined the black chinned antbird (H. melanopogon) and band-tailed antbird (H. maculicauda) that come into geographic contact along the eastern edge of their range. They used a genome-wide SNP dataset and fastsimcoal2 to test whether these sibling species evolved via speciation in allopatry with secondary contact or whether parapatric speciation is in play. A model of parapatric speciation was rejected, and the best model was one of an initial allopatric phase followed by secondary parapatry. I was taken by this talk because the genomics of speciation is still a relatively recent field, and focused primarily on model taxa or non-model taxa in temperate regions. I was impressed to see a well-executed genomics approach to a speciation question in a tropical bird species by a graduate student. Keep an eye out for this student’s work! 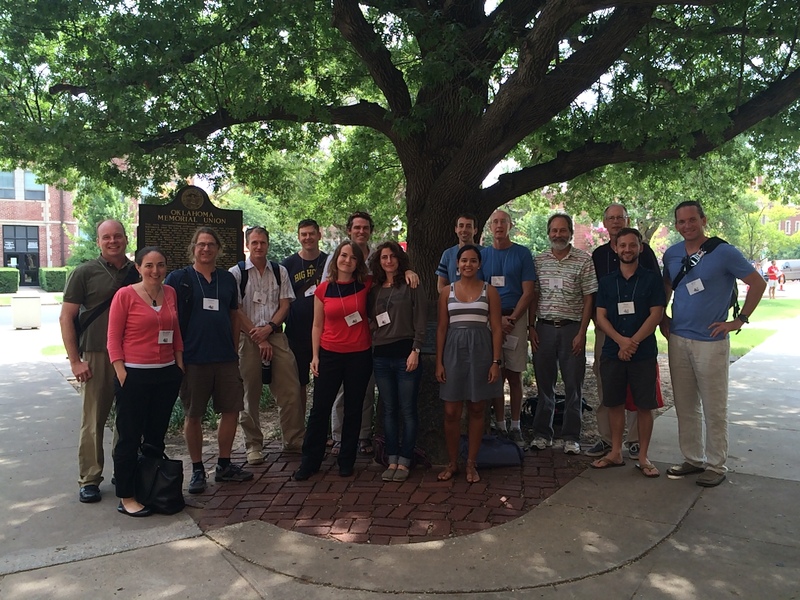 Elizabeth Hobson, trained in Tim Wright’s lab at NMSU and now a postdoc at the National Institute for Mathematical and Biological Synthesis, was one of the early career professionals who took part in the lightning slide talks this year at AOU. Dr. Hobson integrates behavioral assays and cutting edge network analysis to address questions about the emergence of group-level social structures. Using novel captive groups of monk parakeets (Myiopsitta monachus), she asked questions about whether rank affects how individuals decide to target aggression and potential cognitive mechanisms involved in inferring own and others’ ranks. Rank does affect target choice, and after a week of settling into new groups, individuals shift in behavior to preferentially target aggression against those nearby in rank. Her modeling work revealed that individuals could use subsets of the aggression network to infer third-party relationships. This ability for social memory and inference allows individuals to avoid costly social interactions and instead target those most likely to threaten their own position in rank. Plus, the network models make for great visualizations of quantitative (behavioral) information! There were many more excellent talks and posters given by early career ornithologists, and I congratulate the organizers, Eli Bridge and Jeff Kelly, for putting together an engaging, intimate AOU-COS meeting this year. Be on the look out for next year’s exciting, largest-ever North American Ornithological Conference, NAOC 2016. Left-right: Kevin Burns (Curator, San Diego State University Museum of Diversity), Liz Derryberry (faculty, Tulane University), Andy Kratter (Collection Manager, University of Florida Museum), Phil Stouffer (faculty, LSU), Matt Carling (Curator, University of Wyoming), Sinéad Borchert (Stouffer lab, LSU), Robb Brumfield (Director, LSU Museum of Natural Science), Clare Brown (Sheldon lab, LSUMNS), Ryan Burner (Brumfield lab), Angelica Hernandez Palma (Stouffer lab, LSU), Mark Robbins (Collections Manager, Kansas University), Terry Chesser (Curator, Smithsonian), Fred Sheldon (Curator, LSU MNS), Oscar Johnson (Brumfield lab), Jared Wolfe (USDA Forest Service).